A very Happy New Year to you and may 2015 bring you prosperity and that much-needed break. Talking about breaks, there was a time when listeners kept the volume high on their radio sets during ad breaks. 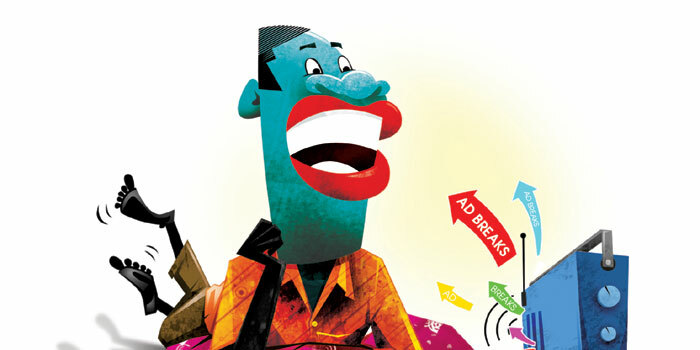 This was a golden period for advertisers as they knew their product would be heard. During that time, the advertisements that aired during the break were not as many as we get to hear today. Yes, ad revenue is the main revenue for radio, but when a listener has to go through a break that is as long as two songs it becomes a monotonous listening experience, which only leads to them tuning off. Also, the quality of creative work has plummeted considerably over the years. Maybe ita��s the work load or a case of wrong people on the job but, whatever the reason, the breaks today make you want to turn off your radio set. Currently, many stations follow the rule of letting just a set number of brands advertise during a break. This is a relief not only for the listener but also the advertiser. As a brand, youa��d always want your product to get an exclusive hearing or at least get heard in a not-so-cluttered spot break. There are stations that have just five ads in a break, which is very considerate on their part. Many brands today dona��t want to advertise in breaks, but literally integrates with the station itself. The new trend adopted a few years ago is to get brands like car manufacturers and hospitals to consumer products to partake in activities across the city, giving more visibility to the product as well as for the station. This is a better way for products to be showcased, as seeing is always believing, which further amounts to recall. So if you want to advertise on the medium do it in the most visible way, as getting a slot on the ad break is like taking a journey on a crowded, slow moving bus.